Announcing Our May 18th Salon Series! #WhereIsBeauty is an art noir short film and beautifully raw story of a woman during intimate moments of self-reflection while identifying her personal standard of beauty where social media tends to homogenize women. NINA, mid 20’s, is a visual artist whose art depicts the feminine beauty of all women but struggles with self-identity as a multicultural millennial woman. While flipping through social media her frustration leads her to brood over old photos of complex stages in her life. She’s inspired to create a portrait that represents her personal voyage to self confidence and finally see her beautiful self. 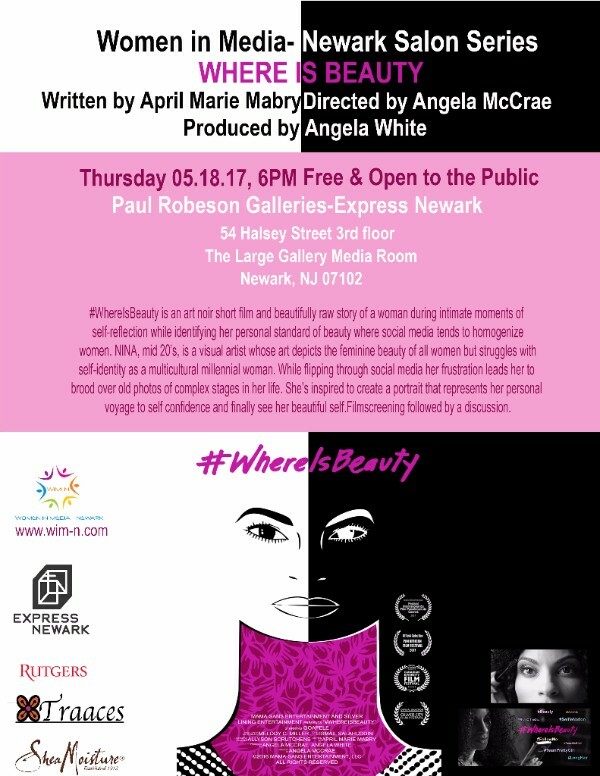 Film maker Angela McCrae and Producer Angela White will join us for a Q & A following the screening. Shea Moisture, one of this evening's sponsors will have free beauty products on-hand for distribution to our audience members.